In this article we will give you, brief information about ” Augmented Reality Magazines ” . Engaging readers getting more important in digital world. As a publisher and / or author you need to create valuable content but this is not sufficient to attract readers. You need to load more digital content such as photos , graphics , links and QR codes. 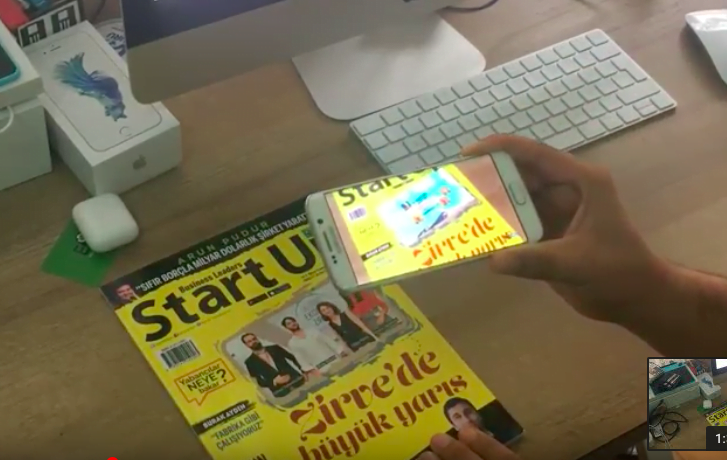 How about enriching your contents with videos by using Augmented Reality on your magazines? That is recently is the most appealing way of adding context. The above video is the use of CXOCARD Augmented Reality software for Magazines. This demo is prepared by by the company itself. Part of the cover page is selected as target and it is matched with video content on CXOCARD servers. As you see in the video, CXOCARD application detects the target and starts to play your video content that was previously loaded on the server. In some cases there may be a delay based on the speed of your internet service. If you improve the speed of your connection, the video will start immedietly. On CXOCARD server, the video contents are optimized for video stream. Therefore, you could use CXOCARD with 3G mobile connection. Using CXOCARD as an Augmented Reality for Magazines is a new way of interacting with users. You could use multiple video contents for different pages of the magazines which highly enrich your interaction with the readers and the content of your media. You can also track the number of views using the statistics done by CXOCARD Application. If you are running a promotion campaign for your magazine, could integrate the promotion code at the end of the video content. Also, CXOCARD can report the numbers of views of the campaign codes simply by counting how many times videos has been watch. CXOCARD is available for most of the mobile devices ( IOS & Android ). It’s also free for magazine readers. By using CXOCARD application, you as the publisher or the author you will get the most innovative way of engaging more readers. The Augmented Reality experience in your magazine will give the edge most magazines and readers currently don’t have.